"Relief" refers to the amount of forward curvature to the neck. 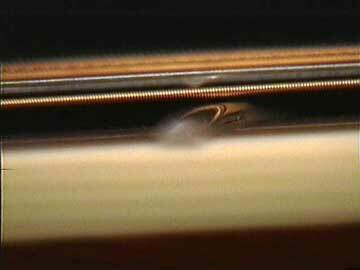 If you then look CLOSELY, you can see how high the string is held away from the frets at the midpoint between your two hands. Most of us would describe this as a relatively high relief. Somewhere around 0.010" would be a low relief. It's not too difficult to "measure" the clearance by just looking at it. All you have to do is try to visualize the size of string you could pass between the string you're holding down and the fret in question. Here it looks like I could stick an extra third string right in there, so I'm estimating about 0.025" of relief. If it looked as though there were only enough space for a first string to fit there, then I'd have around 0.010" relief. This is only a matter of estimating, and there's no need to be more accurate, because as in all aspects of action, the ultimate test is playing the instrument. "Trial and error" really is the best way to get things right, actionwise. Now there's literally no clearance at all. When there's NO relief at all, I can't tell if the neck has a reverse curve or "back bow." That in itself is the best reason to make sure there is always at least a LITTLE relief. 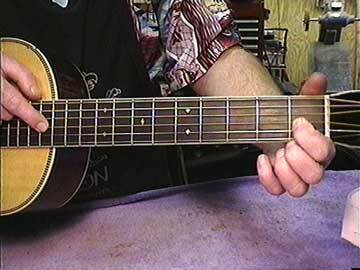 A backbowed neck will most likely buzz on the "downhill side" of the curve, between the nut and ther fifth fret. 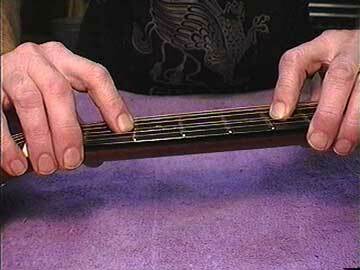 Don't forget that the measurements will be much closer between the string and the frets. In fact, I use this technique only to determine if there is some relief in one area and none in another, not for checking the actual amount of relief. Now, here's how I apply neck relief to buzzing. If the neck is healthy, meaning that the curvature is relatively even along its length, the frets are in good shape and the truss rod straightens the neck smoothly, then I can predict something about the action, buzzing and relief. If there is terrible buzzing only in the lower portions of the neck, from the nut to the fifth or seventh frets, then I can presume there isn't enough relief, or that there's a "backbow" to the neck and fingerboard. The cure is to loosen the rod to allow more relief. If there is buzzing only from the seventh to the body, then I can assume there's too much relief. Now, the cure is to raise the action at the bridge, and tighten the truss rod. 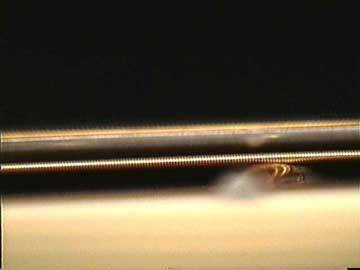 That way, the action will remain the same at about the twelfth fret, and the string won't have to be displaced downward so far to meet the tenth or eleventh.